Cataract –that is the clouding of the originally clear lens. In an advanced state it is possible to detect the grey colour behind the pupil hence the German term “Grauer- grey- Star.” It is like glancing through a fog which with the passing of time becomes denser. If cataract is not treated it can lead to blindness. Today it is possible to replace the clouded lens with an artificial lens implant for an “unclouded” vision. The most frequent cause for cataract is the natural ageing process and an insufficient nutrition of the eye lens. Lens metabolism slows down, the concentration of liquid in the lens lessens, and the lens begins to stiffen and loses its elasticity. In the course of time sunlight leads to the deposition of yellow-brown substances which cloud the lens. 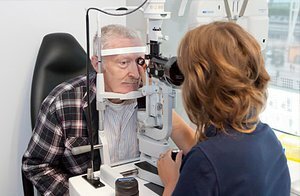 This is called age-related cataract which occurs mostly after the age of 60, with a predisposition it can occur earlier. Other reasons are metabolism illnesses such as diabetes, chronical inflammation of the eyes, eye injuries, radioactive radiation or innate lens opacity. The main symptom is a slow deterioration of the vision frequently affecting both eyes. At an earlier stage it seems like looking through a fog which becomes continuously denser. The sensibility for dazzle increases. Images become more and more blurred losing intensity and colour. In everyday life things such as reading, driving or watching TV become more difficult. If cataract is not treated, the result is reduction of sight to the perception of light and dark. In extreme cases it can lead to blindness. It is easy for the ophthalmologist to diagnose cataract. The visual acuity is reduced. An examination with a split lamp shows the lens clouding - it can be helpful to widen the pupil with eye drops. In an advanced state, the lens clouding can be detected with the naked eye. The good news first – cataract is easily operable. The cataract - that is the clouded lens - is removed and a new artificial lens implanted. 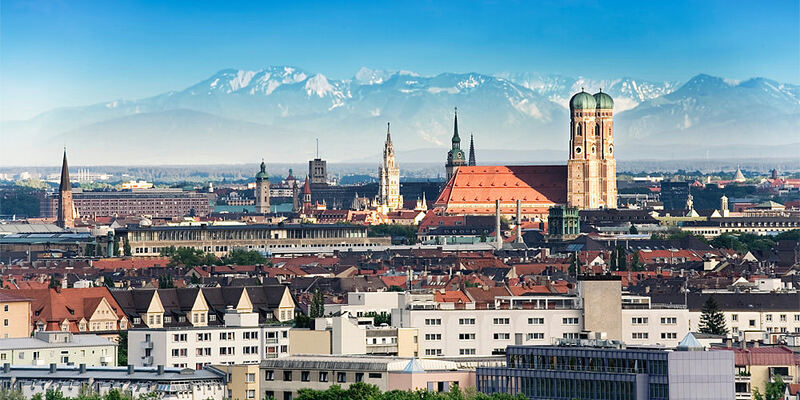 Cataract surgery is one of the most frequent surgeries worldwide – in Germany alone over 600.000 times annually. It is a gentle routine surgery, with a low complication rate – mostly an out-patient treatment with local anaesthesia. In former times surgery was carried out only with an advanced state of cataract. Today surgery is carried out when the patient is disturbed in everyday life by the clouded lens. That is the reason why surgery is individually chosen by the patient and the surgeon. Healing cataract with medication such as eye drops, pills or alternative therapy is not possible. Glasses do not work either. If it is not treated it can lead to blindness. With cataract surgery, the clouded eye lens is removed and replaced with a new artificial lens. If both eyes are affected, one eyes after the other is treated (normally the weaker one first). After recovery the second eye is treated. To be able to determinate the gradation of the new artificial lens, the corneal curvature is measured and the length of the eyeball determined with ultrasound or modern laser technology. The general health condition of the patient as well as his medication - especially blood diluents – is controlled. These examinations serve to guarantee the highest possible safety. Surgery is carried out under local anaesthesia, patients are allowed to eat and drink up to 6 hours prior to surgery. In the last 6 hours before surgery, patients are only allowed to drink. Diabetics should clear their medication with their general practitioner. Prior to surgery our anaesthetist supplies the patient with medication for sedation and relaxation. He also monitors the patient during surgery (ECG, blood pressure and pulse measuring). There is no need for general anaesthesia due to the application of special eye drops that sedate the eye and lead to complete insensitivity to pain. During surgery the patient is awake and responsive. Before surgery the eye is cleansed thoroughly with a disinfecting solution and the face covered with sterile cloths. The patient is given additional oxygen; the cloth is positioned over the face –similar to a tent in order to avoid a sensation of tightness. During surgery the upper and lower lid are kept open with a small spring (surgical lid-barrier). You do not have to keep your eye open by yourself. To prevent the eye from drying, a wetting agent is applied in regular basis on to the eye surface. You can feel the liquid running down your eye. The surgery itself is carried out under a special surgical microscope. After local anaesthesia the surgeon makes a small incision, shorter than 2mm. This incision opens a small aperture that allows access to the inside of the eye. Through this aperture the natural cloudy lens is liquefied by ultrasound and suctioned. The lens capsule remains intact. It surrounds and protects the eye lens and, at the next step, serves as “carrier” for the new artificial lens. Prior to implantation, the new artificial lens is folded by the surgeon. Due to this the aperture through which the lens is inserted into the eye, can be microscopic. The artificial lens unfolds itself in the lens capsule and slides into its final position. Flexible bars keep it in the capsule sack. The new lens is in the same place where the old natural one used to be. The procedure is so gentle that the microscopic incision does not have to be sutured. It closes by itself - similar to a valve – without scars. Normally the surgery is over in less than 10 minutes. Generally speaking, the whole stay in the Smile Eyes Clinic is less than 2 hours. Laser technology inaugurated a new era regarding precision and makes the surgeon´s scalpel unnecessary. A computer-guided laser calculates the eye structures and plans the treatment steps. Laser allows precise surgical entrances, exact lens opening and individually calculated lens core partition. 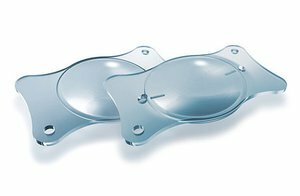 This saves superfluous ultra sound energy and guarantees a perfect placing of the artificial lens. The operated eye is covered with an ointment bandage. After a certain monitoring phase we let you go home. You are not allowed to drive a vehicle so please bring an accompanying person. For several hours after surgery you should not be alone. Even if you are home again very soon after surgery your treatment is not completed yet. On the day of surgery take it easy. Best is to lie down at home. The first day after surgery the ointment bandage is removed and the eye examined. Your doctor gives you medication which you are supposed to take according to his instructions. 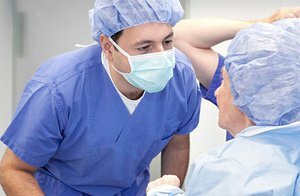 On the whole, during the first days after surgery you will notice a considerable improvement of your visual faculty. But initially for a short time the vision is compromised by the irritation of the eye. You have to show a little patience until reaching your final good visual acuity. Please take the prescribed medication regularly and punctually and respect the appointments for examination. If you cannot administer your eye medication properly by yourself, please let friends or family help you! Also a professional health care service could support you. If you have any question we are here to help you. Do not squeeze or rub your eye in any event. Even with a small self-closing incision, your eye has not yet regained its normal robustness. Working or driving a vehicle depends on the visual acuity after surgery. You can take active part in street traffic with the expressed permission of your ophthalmologist. Since more light passes through the new artificial lens than through the old cloudy one, in the first weeks after surgery most of the patients prefer wearing sunglasses that also serve as protective glasses in adverse weather conditions. Watching TV is generally possible, even shortly after surgery. It is possible that you will need glasses despite your cataract surgery. Your ophthalmologist calculates the grades for your artificial lens exactly according to the data of your eye – but the correction is only possible to a certain extent. The aim is to achieve a minor short-sightedness with no need for glasses for middle distances. Glasses are needed in order to achieve an optimal vision for far and near ranges (reading, handiworks, etc.) with normal thin lightweight glasses. So as before surgery you either need two different glasses – one for short and the other for far distances – or only one with multifocal lenses for both distances. With cataract surgery it is possible to implant a special premium lens, a so-called multifocal lens which allows a life without glasses. We will be happy to provide you with information. Costs for surgery are covered by statutory health insurance; the standard lenses supplied are of good quality. For individual wishes and special requirements, new innovative artificial lenses with a higher quality than the standard lens can be supplied. 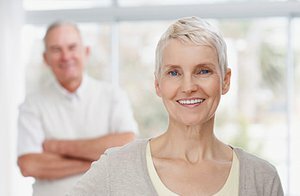 Modern cataract laser surgery can incur additional costs which your physician will explain to you in a personal consultation. Statutory health insurances cover the standard cost for cataract surgery - the additional costs for the premium lens as well as the additional surgical expenses have to be paid on a private basis. We will be happy to provide you with information. High quality standard lenses. These are year-long clinically proven acrylic lenses of very good quality which can offer you good and safe vision for the rest of your life. Premium lenses with a specific optical characteristic. These lenses offer an additional plus in visual quality. At Smile Eyes we use exclusively tinted premium lenses which function as additional sun-shield and preserve your retina. Costs for premium lenses are not taken over by statutory health insurance. These have to be paid for on a private basis. Private health insurance normally covers the costs in full or in part. Aspherical premium lenses with improved light protection are lenses with special aspherical optic characteristics which are also used in other optically demanding systems such as high-quality glasses, telephoto or telescopes. The eye gains additional visual quality, the colouring acts as an additional sunscreen thus preserving your retina. The lens is individually chosen and calculated for your eye. Note: after the implantation of a premium lens, for reading you will still need weak reading glasses. Private health insurance covers the costs. Independent from the lens clouding, nearly a third of the patients suffer from corneal curvature. With “normal” cataract surgery, glasses are still needed to compensate this kind of defective vision. In order to avoid the need of glasses for far distances, the corneal curvature can be compensated with the implantation of a special lens. This is a lens that neutralizes the existing curvature of the cornea. This lens is specially manufactured and implanted with small laser surgery. With an optimum surgical result glasses for far distances are not needed any more. If surgery does not lead to a perfect result this can be corrected with a minor second laser treatment. The necessity for light reading glasses remains. These glasses are available at low cost since elaborate varifocals or glasses for corneal curvature are not needed. In most cases private health insurances cover the costs. 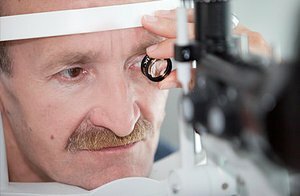 Patients that explicitly want a life without glasses after surgery can fall back on a special lens with various focuses that allows seeing objects in a far, middle and close distance without glasses. This is the reason why these lenses are called multi- or trifocal lenses. With this kind of lens the need for glasses is the exception. In very rare cases a subsequent laser correction of the cornea is needed. The big advantage of never having to wear glasses is “purchased” with a slightly diminished visual quality in single sectors. The reason for this lies in the physical principle of the multi-/ trifocal lenses which constantly divides the light between near, intermediate and far distance. This type of correction is apt especially for patients that because of their active life style wish to be independent from glasses. Private health insurances normally cover part of the costs. Complications during cataract surgery and during the healing phase are possible but are exceptions and in most cases can be treated easily. 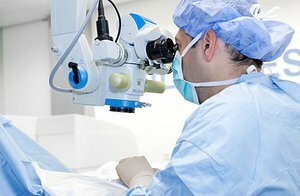 Prior to surgery your ophthalmologist will explain the surgery and its risks and answer all your questions. It is important that even weeks or months after surgery, in case of pain or a deterioration of the operated eye you contact your ophthalmologist immediately. Patients that undergo cataract surgery can develop a post-operative clouding that is an increase of tissue in the capsular sack which leads to a renewed deterioration of vision. Through soft laser treatment a central aperture in the clouded posterior capsule is opened thus the optical axis inside the eye is free and vision improves again. This intervention takes only a few minutes and can be carried out in the doctor´s practise so there is no need for hospitalisation.